American rockers Sixty 8 are determined to defy convention and stand the American music scene on its head while at the same time making you wonder, 'Where have I heard this before and why does it sound so good?' The reason is simple: Sixty 8 deftly dovetails classic rock and metal with modern nuances into their own self-defined genre they call retro-metal or nu-classic rock. Whatever. Frankly, there's nothing earthshaking or intensely novel here: 'Before The Fall' is simply entertaining and satisfying rock/metal music. Forget Nickelback and other contemporaries. Sixty 8 is the real deal. Two things make this work compelling. The first is the amazingly passionate and versatile vocals of Tryg Bundgaard. He's equal parts Coverdale and Rose with a host of others thrown in for good measure. For my money, he steals the show on songs like 'Blood Red Sky,' 'The Race Goes' (Axl) 'I Won't Play' and 'All She's Ever Known.' Secondly, there is the shear depth and breadth of song composition: there is enough variety on this album to please any rock music lover. There are touches of melodic hard rock, melodic metal, modern rock and combinations of the three. As a unit, this band delivers the songs with compelling precision and strength. Additionally, the production and mix is nothing short of brilliant (listen for the bass!).. Now for the songs themselves. The work opens with 'Blood Red Sky,' a strong melodic hard rocker with a metal edge thanks to the heavier riffs and Bundgaard's screams. These guys mean business. From 'Interactive' to 'Better Days' you're treated to basic melodic hard rock wrapped in a modern rock wrapper. The best of these is the incredibly orchestrated 'Any Race Of Man' where, again, Tryg shines and the lead guitar thrills. After 'Better Days' to the end melodic hard rock with a dose of metal here and there rules day. 'The Race Goes On' brings a raw rocker with a true metal tone with wild vocals and twin guitar solos. Equally impressive is 'I Won't Play' with it's steady pace and strong riffs. Another highlight is the rock ballad 'All She's Ever Known' whose acoustic foundation and passionate vocals define its intensity. Finally, there is the best cut on the album (at least for me), 'Killing Time.' It begans with a tandem acoustic and electric opening only to move towards an epic melodic rocker worthy of stadium filling appeal. Even though there is hardly a dull moment on this album, I did tire a little during the modern rock influenced stretch at the beginning. This accounts for the less than perfect score. Obviously, I found Sixty 8's 'Before The Fall' to be a compelling and entertaining musical adventure. This is simply solid American melodic hard rock and metal they way it should be done. I knew it existed somewhere. Why people wallow in the mud of Hinder and Nickelback when they could be living in the green grass and high tides of Sixty 8, I'll never understand. We just got to get the word out. Highly recommended! 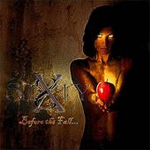 I found Sixty 8's 'Before The Fall' to be a compelling and entertaining musical adventure. This is simply solid American melodic hard rock and metal they way it should be done. I knew it existed somewhere. Why people wallow in the mud of Hinder and Nickelback when they could be living in the green grass and high tides of Sixty 8, I'll never understand.